To see my ratings on any of the books click on the Goodreads button on the right. The first time I read Amaryllis I checked it out from the public library. I loved the book so I checked and found that there were two other books in the series. I purchased those two (Zinnia and Orchid) as they were not available in the library. Not long after that I decided I wanted to own Amaryllis but found it was not available. In fact I think it was listed as out of print. Imagine my surprise when on a recent visit to Barnes and Noble I found Amaryllis with a brand new cover on display at the front of the store. Amaryllis is set on the planet of St Helen’s. Like her later books about Harmony, St Helen’s was settled when the curtain allowed easy travel between worlds. When the curtain closed the colonist were cut off and had to adapt to their new world. No Earth manufactured products lasted long after being on St Helen’s. The colonist had to learn to manufacture everything out to native materials. During this time the colonist started to develop new physic powers that could only be used when paired with someone who was a prism. When Lucas Trent hires Amaryllis Lark to act as his prism they find that both have off the chart talents that match perfectly. As they work together they uncover a physic plot sends them into danger and an attraction that is hard to ignore. This series is not quite as intense as the later series set on Harmony. However, it is still an exciting and satisfying read. Pocket Books published Amaryllis by Jayne Castle in1996. Jayne Castle is a pen name for Jayne Ann Krentz. I am a big fan of Sharon Lee and Steve Miller’s Liaden series and wait anxiously for each new addition. When Baen announced that I could get Mouse and Dragon as an eBook ARC months before the release date I could not resist. I purchased, started reading and did not put it down until I had finished. All in all it was a very satisfying read and explained many of the unanswered question from other books in the series. Mouse and Dragon is the side story of Daav and Aelliana, Van Con’s parents. It takes place before the start of the main series and also provides a bridge to Fledging and Saltation. It is a great addition for fans of the series and could be a good introduction for those who are just discovering the Liaden series. 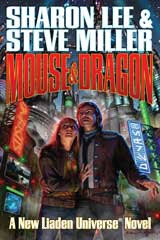 Mouse and Dragon ARC by Sharon lee and Steve Miller is available as an eBook on the Baen web site or you can wait for the print version coming in June of 2010. Galactic Derelict is one of the seven original issue Science Fiction books I picked up at a Garage Sale last year. It was published in 1959 and sold for 75 cents. If it was still in print today it would sell for 10 times that today. 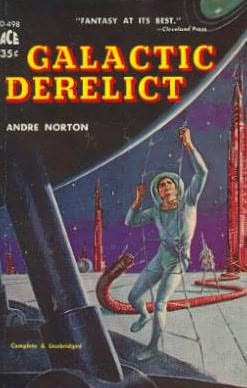 Some of Andre Norton books are being reprinted so there is a possibility that Galactic Derelict will be available as a new book in the future. Galactic Derelict is a sequel to Time Traders but can easily be read as a stand alone. Most of the story still holds up today. The one exception is the political background. Written at the height of the cold war it reflects the politics of the time. The United States is in a race with the Reds for ships that crashed on Earth in the distant past. Travis Fox has joined Ross Murdock and Dr Gordon Ashe as time agents. They are attempting to bring an intact alien ship to the present. The ship arrives in the present time but the transfer has set off the alien autopilot. Before they can stop the sequence they take off on a trip to the alien home world. The story is full of adventure and strange new places. Woven throughout is the need to find a way to return home and the tension that produces. Andre Norton always told a good story and Galactic Derelict is no exception. My copy of Galactic Derelict by Andre Norton was published by ACE in 1959. The Science Fiction Book club at the Bella Vista, AR library chose The Left Hand of Darkness as our book for March. The story sparked a lively discussion. Set on the planet Winter, Left Hand of Darkness features humans who have been genetically altered. A small part of that alteration is an increased tolerance to cold. The most important part of that alteration is the removal of two distinct sexes. Most of the time the people of Winter, called Gethenians, are sexless but once a month the go into heat and can become either male or female. The following quote highlights some of the discussion posibilities. I highly recommend The Left Hand of Darkness to any book club. The discussion possibilities are multiple and we did not even scratch the surface during our one-hour meeting. After reading the book I can see why it won both the Hugo and Nebula Awards for best Science Fiction novel of the year. 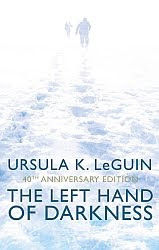 ACE published The Left Hand of Darkness by Ursula K. LeGuin in 1969. The current edition ( which is also the 40th anniversity edition) was published by Little Brown Book Group. I checked The Left Hand of Darkness out from the Rogers Public Library. As we get older out bodies become less efficient. For some of us that leads to intestinal disorders; foods that we have always eaten become part of the problem. That has happened to me. I searched for help and found The New Reading Right for a Bad Gut and What to Eat with IBD. I found both of the books to be useful in learning to live with my new reality. I would like something that said do this, this and this to prevent further problems. As far as I can tell that does not exist. This is a problem that varies from individual to individual. That said I found helpful suggestions in both books. If you are one of the many who have this problem I recommend these books. Plume published The New Eating Right for A Bad Gut by James Scala in 2000. CMG Publishing published What to Eat With IBD by Tracie Dalessandro in 2006. I purchased The New Eating Right for a Bad Gut and What to Eat with IBD from Amazon. You always get what you don’t ask for. That is the mantra of Athena Hera Sinistra. When her Daddy Dearest insists that she accompany him to Circum Terra she gets a lot of things she never asked for. It all starts when some of her father’s bodyguards try to knock her out and she escapes in a life pod. Unable to trust anyone she runs to the powertrees, hits a darkship and is captured by someone with cat eyes and a wild sense of color. She discovers a whole new world and some dark secrets from her own existence on Earth. It turns out some of what she did not ask for is what she really wants. Darkship Thieves by Sarah A Hoyt an exciting story set in a world several hundred years in the future. The characters are well drawn, the plot moves at an even pace and the events are often surprising. If you like Science Fiction Romance pick this one up. 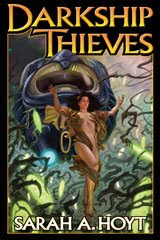 Baen published Darkship Thieves by Sarah A. Hoyt in January 2010. I purchased Darkship Thieves as an eBook from Baen and sideloaded it on my Nook. I recently discovered books by Loretta Chase. I started with Miss Wonderful, then Lord of Scoundrels followed by Mr. Impossible. If you like humor, romance, adventure, and more humor contained in a well-written book these books are for you. Each book has a crisp, well-defined plot filled with characters that come alive on the pages. Miss Wonderful and Mr. Impossible are part of the series following the Carsington’s. Lord of Scoundrels is a stand-alone. If I had to pick I favorite among the three it would be Mr. Impossible. Rupert Carsington is the fourth son of the Earl of Hargate. He is often bored and boredom leads him into trouble. In despair his father sends him to Egypt where Rupert ends up in prison for defending a street person from the police. His only way out is to agree to help the widow Daphne Pembroke rescue her brother. Daphne is the scholar in the family but her brother fronts for her because no one listens to a woman. This is a role reversal as Daphne is the brain and Rupert has to play the empty headed brawn. As they move from one crisis to another Rupert does not have time to be bored. Mr. Impossible is filled with brisk dialog, wonderful supporting characters, and great humor. Berkley Sensation published Miss Wonderful, and Mr. Impossible by Loretta Chase. Avon published Lord of Scoundrels. This is as good as Along Came a Demon. There is good character development, the paranormal world is expanded and the plot moves at a brisk pace. Linda Welch is an author to watch. The copyright for the Demon Hunters by Linda Welch is 2009. There is no publisher. My book carries a printing date of 14 February 2010. 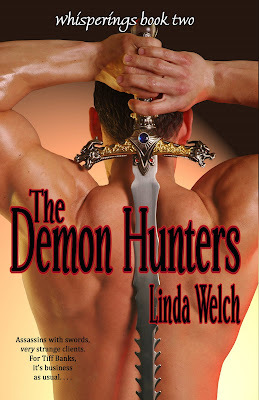 I purchased The Demon Hunters by Linda Welch from Amazon. Watch for book three, Demon on a Distant Shore. I picked up both Archangel and Quatrain by Sharon Shinn on a recent trip to the library. I previously read one book in the Samaria series and all of the books in the Twelve Houses series. Archangel is the first book in the Samaria series and Sharon Shinn has created an unusual world. When this world was settled the starship Jehovah stayed above the world. The world was populated with angels and ordinary mortal people. The world was to stay at peace and harmony. The angels with their wonderful singing voices were to guard the mortals, oracles were to guard the forbidden knowledge and Jehovah was to watch over all. Hundreds of years have passed and all of that harmony is in danger. Jehovah has chosen Gabriel as the next archangel. The archangel’s mate or angelica must be a mortal and Jehovah has chosen Rachel. Rachel does not want the job, Raphael, the current archangel, does not want to step down, and many no longer believe in the power of Jehovah. Disaster and chaos are treating to destroy the world. There is a wonderful flow to Archangel. Sharon Shinn takes the time to develop the characters, and build the world while keeping the story moving. Once I started reading I had trouble putting Archangel down. Quatrain contains 4 four side stories from Sharon’s series. Flight was a wonderful side story set in the same time as Archangel. Flame is set in the world of the Twelve Houses. The other two are from series I have not read. This would be a good introduction to Sharon Shinn’s books and an interesting addition to existing novels. 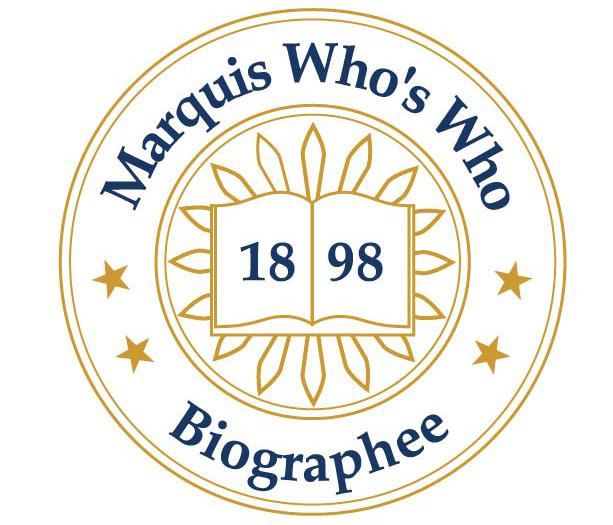 ACE published Archangel in 1996 and Quatrain in 2009. I think award winning author Linnea Sinclair is the queen of Science Fiction Romance and she has written another winner in Rebels and Lovers. The fourth book set in the Dock Five Universe Rebels and Lovers continues to add complexity to the world started in Gabriel’s Ghost. As in all of Linnea’s books the character building is right on target and the plot is filled with action and unexpected twists. The romance does not drive the story but is skillfully woven into the action adding to the appeal. Rebels and Lovers is the story of another Guthrie. The Guthrie’s are trying to consolidate their power after the deflection of Philip Guthrie to the new Alliance. The Guthrie patriarch decides to use the marriage of his youngest son to accomplish this. The youngest is Devin whose talent is in business not catch your breath action. Everything changes when his nephew Trip vanishes. Devin follows a trail that leads him to Dock Five. Makaiden Griggs, a former Guthrie family pilot, is short of funds and her ship is unable to leave Dock Five. She recognizes Trip, sees he is in trouble and moves to help. Devin, Trip and Makaiden find themselves together and on the run for their lives. Bantam will release Rebels and Lovers by Linnea Sinclair on March 23rd, 2010. I belong to Linnea’s Yahoo group. 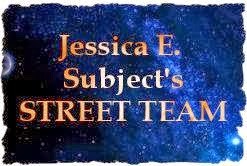 She offered a pre-release pdf copy to any member who had a book blog. I enjoyed reading Rebels and Lovers on the computer but want a hard copy and will be purchasing the book to re-read as soon as it is released. While Rebels and Lovers is part of a series it can stand alone. Be warned, after you read Rebels and Lovers you will want to find the other three.